The private sector created 202,000 jobs in June, offsetting a slight loss of government positions to yield a net gain of 195,000 jobs during the month. Seven of 10 private-employment sectors added workers last month and all 10 sectors have been positive for the first half of the year. Leisure and hospitality led the gains in June, adding 75,000 positions, primarily at bars and restaurants. Hotels also expanded payrolls as the summer travel season started, though the modest gain largely reflects openings of new properties. Professional and business services payrolls also grew by 53,000 positions during the month and have expanded in each month over the past two years. The building services subsector, which includes janitorial services at government facilities, added nearly 11,000 workers, suggesting that greater business from private-sector firms are offsetting the loss of government contracts related to the sequester. The yield on the 10-year U.S. Treasury rose roughly 100 basis points in the second quarter. Most of the gain occurred in the final six weeks of the period after the Fed referred that it could start curtailing bond purchases later this year. The rise in interest rates is not yet appearing in data on home sales and home building, both of which gained momentum during the period. Construction employment has recovered solidly due to the new vigor in the housing sector, with 13,000 positions added in June and 101,000 jobs created in the first half of the year. More than 130,000 workers were hired in the retail sector in the first half of the year as store visits increased and new stores opened. National retail vacancy sat in the mid-10 percent range in the second quarter and is down about 60 basis points over the past year behind net absorption of more than 1.5 million square feet. Higher interest rates, though, could present a headwind in the months ahead. Until recently, low interest rates have enabled many homeowners to refinance and free up cash for spending. Refinancing fell notably in the latter part of the second quarter as mortgage rates escalated, however, and it remains unclear whether this trend will weigh on consumer spending in coming months. Full-time office-using payrolls continue to grow, driven by gains in professional and business services, and financial activities. With the addition of 55,500 full-time office-using jobs in June, approximately 580,000 positions have been added over the past year. National office vacancy was in the low-16 percent range at midyear and will edge down to 15.9 percent by year end as staff additions necessitate larger layouts. 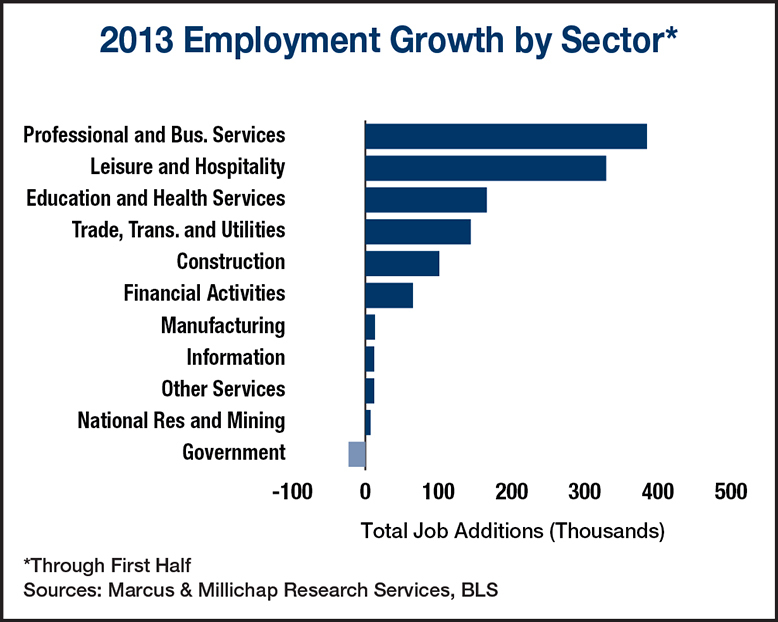 A more substantial decline will occur in 2014 as additional jobs are created and while construction of spec space remains restrained. This entry was written by marcusmillichap, posted on July 8, 2013 at 4:35 pm, filed under Uncategorized and tagged CRE, Employment. Bookmark the permalink. Follow any comments here with the RSS feed for this post. Post a comment or leave a trackback: Trackback URL. Per Investors Business Daily, editorial on July 8, YTD 2013, 130,000 full time jobs added to our economy, 557,000 part time jobs have been added. How is this good news?